This pilgrimage to Rome, while focused on the life and times of St. Benedict, also provides the chance for other spiritual journeys. On Monday, we had a “St Paul Day” which focused on the sites associated with St. Paul’s imprisonment and execution in Rome, around the year 64 A.D.
After a picnic lunch in the shade of the trees in front of the basilica (both temperature and humidity were high), we went on to Tre Fontane, the location where St. Paul was imprisoned and ultimately executed. It is a lovely green, shady park surrounded by a wall, with three church/worship areas inside, and a Cistercian Abbey. 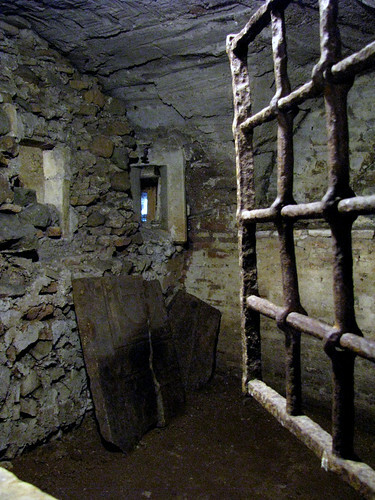 One of the churches is built over the cell where St. Paul was kept imprisoned – very small and dark – before his execution, and from which he was taken to trial. It is possible to view into the cell through a small window cut in the wall – and one sees the bare walls of the cramped space at the top of this post. A second, larger church is on the site of the actual beheading, which is marked by a pillar. That location is probably accurate, but the rest of the legend – that the three springs of water which give the location its name (Tre Fontane) sprang up in the 3 places where his head bounced is NOT true. 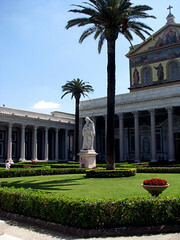 Those three springs were described by ancient Roman writers before St. Paul was born. That didn’t stop people from spreading the story, nor from building a big church with three little altars, underneath each of which one can see the spring coming up. The Cistercians operate a little cantina and sell a variety of products made by them and other abbeys – soaps, dried mushrooms, a variety of wines and liqueurs, herbal medicines and balms. The peace, quiet and beauty of their location invites a person to prayer – although parents were bringing their children into the cool of the open park for play, a reminder that St. Paul’s message was one of life and joy, not of death. It’s been over 30 years since I visited Tres Fontaines, and the only memory I have of it is the scent of dampness, so I was especially pleased with this post!